Welcome to the Crafty Cupcakes Team Stampin' Up! Blog Hop for January 2018. 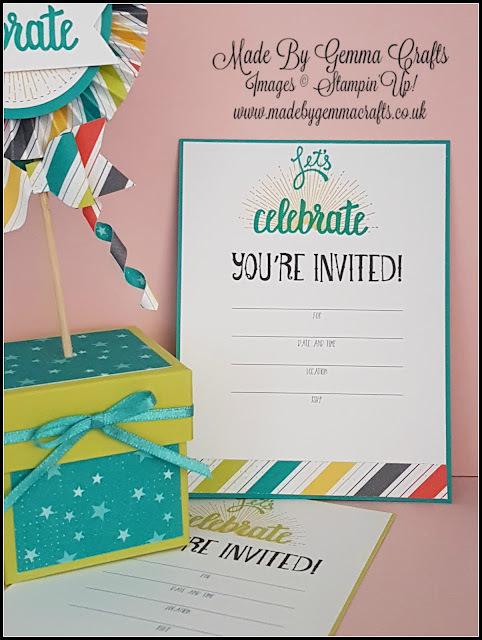 Each month members of the Team take part in our Team Blog Hop to share with you our cards and projects made using the fabulous Stampin' Up! products. You are currently visiting Made by Gemma Crafts and below you will see the full list of everyone taking part. To move to the next blog just click the name after mine in the list. This month our theme is Sale-A-Bration 2018. Thank you for visiting my blog today. Sale-A-Bration is a fantastic time of year with Stampin'Up! as when we spend we get free product and everyone loves something free! The Items available this year are amazing and my favourite is the Bubbles and Fizz DSP. It has some of my favourite colours in it especially Bermuda Bay, which I think goes so well with Lemon Lime Twist. 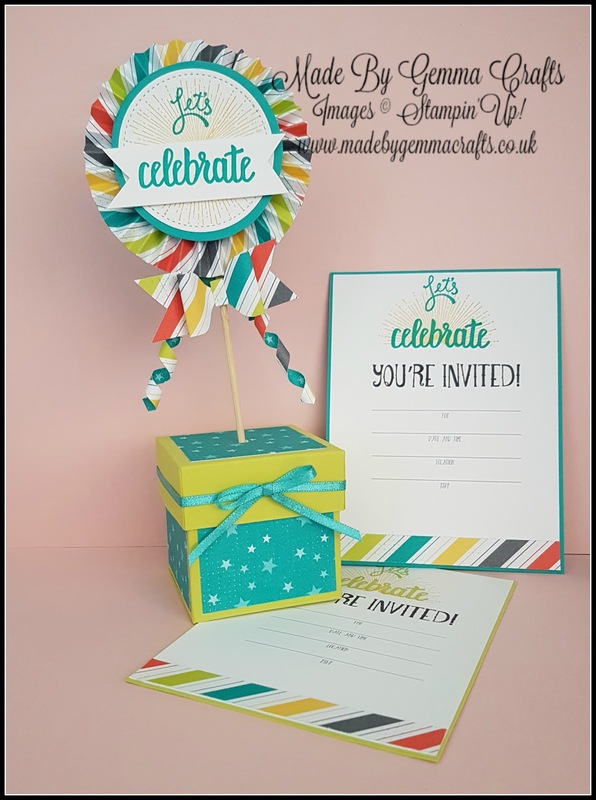 January can sometimes be a bit of a blue month with the festivities of Christmas over so I decided to make a bright and bold table decoration and some cute invites. 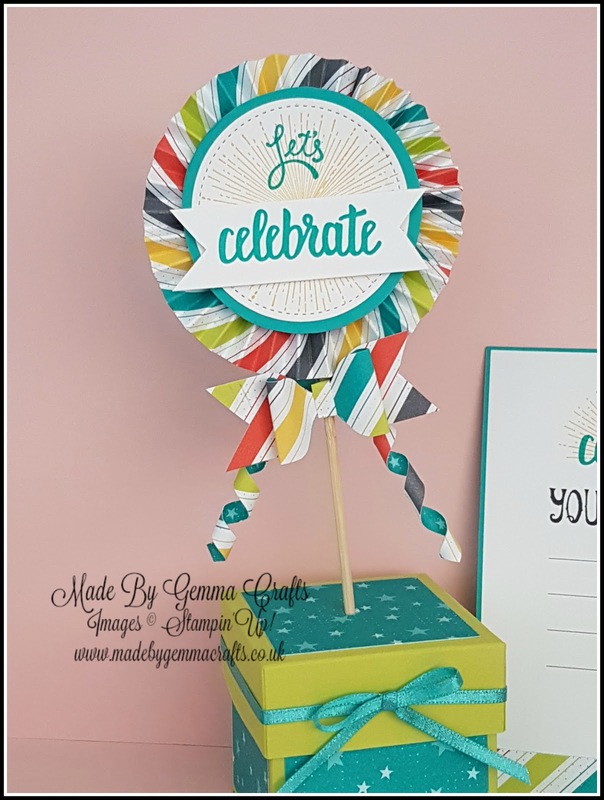 I cut some strips of DSP to make the pinwheel and then attached it to a skewer. I have used the SAB stamp set Amazing you for the stamping on my project. For my box I used Lemon Lime Twist card and then some more dsp to decorate it. The ribbon is also a SAB product, Shimmer Ribbon Pack. For the invites I printed a template onto some whisper white card then decorated them with dsp strips and stamped them, finally mounting them onto some Bermuda Bay and Lemon Lime Twist card. Can you believe that I only used one piece of 6" x 12" of dsp to make today's projects! 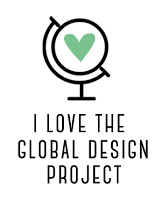 The Team have worked really hard on our Blog Hop to bring you a variety of creativity and inspiration. Make sure you click the next name on the list to carry on through the Hop. Thank you once again for visiting my blog and taking part in our blog hop, there are so many amazing ideas and inspiration you don't want to miss so make sure you carry on hopping through the list. Remember that currently you are at my blog Made by Gemma Crafts so check the Blog Hop line up list above to see who is next.